Tank Bund also makes for an interesting place to visit in Hyderabad. Tank Bund road connects the two parts of the city Hyderabad and Secunderabad. 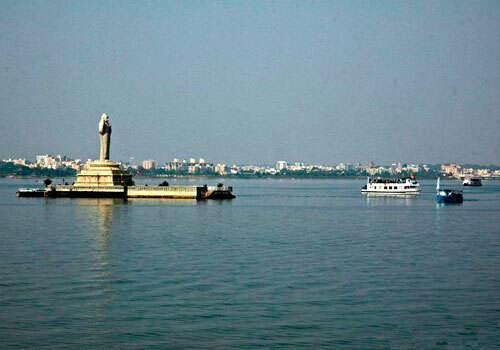 It also dams one of the most popular sightseeing places of Hyderabad, Hussain Sagar Lake, which has the famous monolith of Gautam Buddha in the middle. This statue is said to be one of the largest monolith in the world. 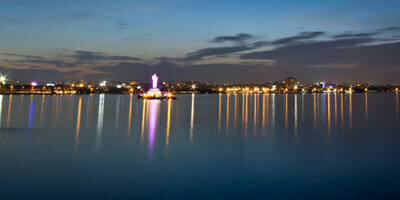 Breathtaking view of Hussain Sagar Lake from Tank Bund is breathtaking which also attracts many to the place. It is spectacular especially in night, when the lights around the statue are switched on. 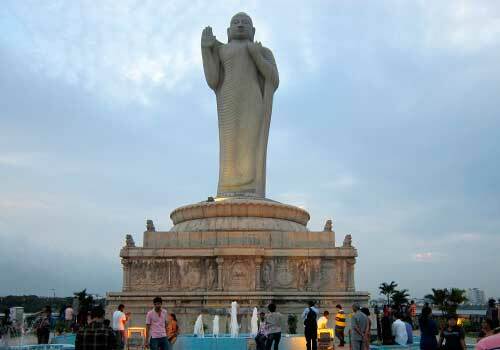 The place is popular for 33 bronze statues of famous people of Andhra Pradesh and Telangana in the area around. Some of these sculpture are of Sri Krishnadevaraya, Nannaya, Tikkana, Yerrapragada,Annamayya, Alluri Seetharama Raju, Raghupathi Venkataratnam Naidu, Molla, Tripuraneni Ramaswamy Chowdary etc. These statues were created in the memory of a few prominent personalities of the state including many renowned poets from Telugu literature, great writers, rulers, social workers and freedom fighters. These sculptures immortalize the incomparable efforts of these personalities in the development of not only their specific field but of entire human kind. Tank Bund even now reminds us of their great achievements, while humbling us at the same time. These sculptures are on both the sides of Tank Bund. These statues were erected by the former chief minister N.T. Rama Rao during 1987-88. Earlier the tank bund road used to be quite narrow and was widened in 1946. Later the place was beautified with the addition of many captivating statues and lush green gardens. Since its beautification, Tank Bund has become a popular site not only among the residents of Hyderabad but also among the tourists. People visit this place for a relaxed outing. 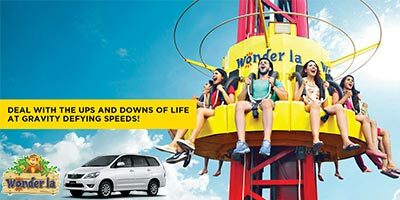 Whether you are visiting with your family and kids, with a group of friends or partner, you will find it suitable for all the purposes. 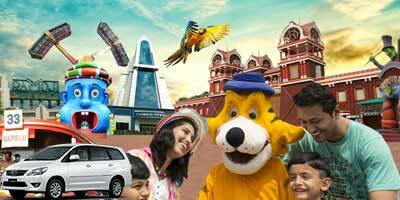 Nearby parks are perfect for family get together with varied playing options for kids. Tank Bund offers a suitable relaxed venue for couples to spend some quiet time with each other by the side of lake, away from the concrete jungle. 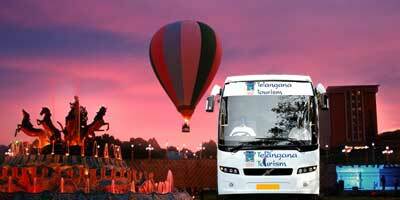 Apart from that it acts as a common point for many popular sightseeing places. Tank Bund enjoys a good location. 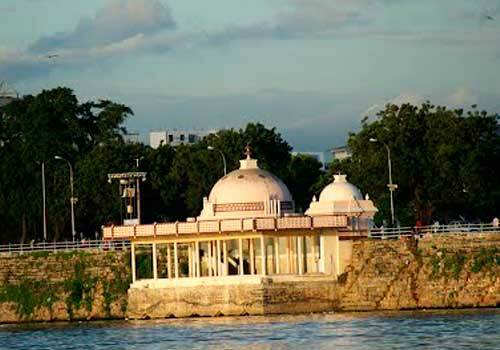 On the southern side of Tank Bund there are Secretariat buildings, the Lumbini Park, the NTR memorial, the Hyderabad boat club. While on its northern side, you have Hazrat Saidani Ma Saheba tomb, the Sanjeevaiah Park and the Secunderabad Sailing Club. Indira Gandhi Park is also located quite close to it. Secretariat and the state assembly are also located nearby. You can also plan a trip to Birla Mandir Hyderabad on the same day as your visit to Necklace Road. Go to tank bund in morning, trust me you will love it. this place is very peaceful in morning. Less vehicles, no pollution and fresh air. In evenings, it is crowded, and too much pollution, because of the traffic from secunderabad, abids and other places. I go to tank band for walks usually, it is nice to look at the lake during sunrise. This place is beautiful in mornings. The most important statue of Tank Bund is the statue of Buddha. It looks awesome in night, when lights are on, different colours of light makes the statue looks even bigger. In evening there is boat to the Buddha statue too from Lumbini park, everything is around tank bund itself. Overall a good place to go, will be better if they can maintain it a bit more. Tank Bund has many statues. There are about 33 statues of Telugu poets, writers, rulers and social workers. Every statue has some story behind it and is related to the history of the place. I couldn’t do much research on the history of tank bund statues, just glanced them while crossing tank bund when I visited Hyderabad last time. statues are intriguing, want to explore more about them. I went to Tank Bund recently, this area looked nice with lake one side. There are many statues too. Tank bund basically connects the two cities, Secunderabad and Hyderabad. It was nice in afternoon but by evening the traffic increases, the road gets too busy and polluted. I guess it would be better to go in morning or late night. 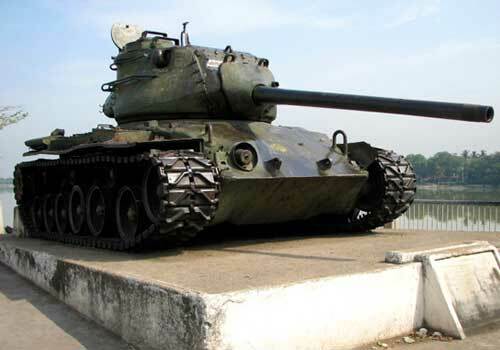 Tank bund is basically the stretch between Secunderabad and Hyderabad, it dams Hussain sagar lake and connects the twin city. Main attraction here is the tank bund statues. These were erected by the former cm of Andhra. 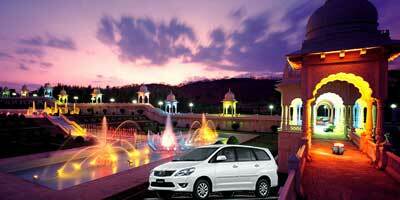 There is nothing special about this place except the parks and lakes which are located nearby. Boating at the lake to reach the Buddha statue was an okay experience. Apart from that nothing much to do. Tank bund road and the area around look pleasant. This road is nicely maintained and kept very clean. This area is so much greener with parks around it and the Hussain sagar lake. I really liked this entire place, it has many statues of prominent personalities too. It is not at all like other cities where you can not find even a single stretch of green. It was refreshing break. But the time I went it was crowded with too many people. Wish to visit again when there are less number of people.